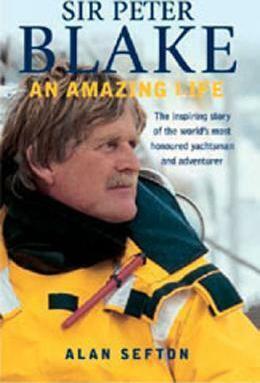 The author, an experienced yachting writer and a close friend, traces Blake's extraordinary life--from the small boy crazy about the sea to the rigors of ocean racing and the high drama of the America's Cup and its controversial aftermath, to the decision to devote his life to saving the world's oceans and finally his tragic death on the Amazon River. Sir Peter Blake led an amazing life so it's no wonder that a book about his life includes the word amazing. Sir Peter Blake: An Amazing Life, written by his great friend Alan Sefton and published by Sheridan House, is a gripping account of Blake's life from his early days sailing aboard his parents yacht in New Zealand to his numerous successes on the international sailing scene. It's a story of triumph and tragedy; a tale of a larger-than-life person gunned down in the prime of his life in a senseless murder in the Amazon jungle. Few people are as qualified as Alan Sefton to write about Blake. Their friendship goes back three decades and Sefton knows the intimate details of all the behind-the-scenes negotiations that landed Blake some impressive sponsorships that led to some equally impressive sailing victories, including winning the Whitbread Round the World Race and the America's Cup. Peter Blake was a quiet, almost shy man despite his incredible presence that instilled immediate confidence both as the skipper of a sailboat and as the manager behind some large and complicated sponsorship deals involving tens of millions of dollars. In the book, Sefton describes where Blake came from and how he matured into an icon upon whose shoulders the pride of a nation rested. Blake came up through the ranks sailing as crew in his first Whitbread in 1973-74 aboard the problem-riddled BURTON CUTTER before graduating to watch captain aboard HEATH'S CONDOR. He then skippered CERAMCO NEW ZEALAND and LION NEW ZEALAND before finally winning the Whitbread with back-to-back leg victories on the ketch STEINLAGER 2. As head of New Zealand's America's Cup bid, he saw both the successful winning and defense of the Cup. Perhaps the most interesting part of the book is what Blake did after his competitive sailing career. Those who knew Blake well knew about his passion for the environment and how much he relished time spent on the open ocean. After a brief stint as head of the Cousteau Society, Blake opted to form his own environmental movement and bought the massive sloop, SEAMASTER. Blake believed that he could change the way people looked at the world around them through televised expeditions to some of the most pristine and remote places on the planet.